A place to relax with a cup of hot cocoa and read. So I have actually posted pictures in the photo gallery already, if you really want to see all of the wretchedness that was the daycare. First of all, though, I have to say that I may have been a moron for putting up with them, but I have a chance to redeem myself as we have lost the daycare account. It was through no fault of mine, apparently my boss couldn't get the wax on the floor right. (And they were highly particular about their floor.) They told him they would try someone else to get the floor right, but if it was the floor and not the man, we may hear back. We haven't heard back and it has been almost two weeks. Just to give you an idea of the floor, here's a picture. Oh, sorry, that's the preschool mess I have to clean up. But as you can see, the tiles are waxed. Scraping up dried mashed peas also scrapes up wax. Not my fault they didn't clean up their mess while it was still fresh, still wet. This picture looks like they didn't have a broom available to them, but yes, they did. They just left this mess for the cleaners. Secondly, every night I went to work, I had to get into the "What moronic thing will I find tonight?" mentality or be completely floored by the stupidity I did find. For all of their issues, the infant room was a no shoes, no socks room, so I have to put on surgeon booties to clean in there. Yes, I just wore them all over the place, even outside if I had to run to my car. The did complain once that the floor in the infant room had dried food stuck to it and also that the toddler room floor hadn't been cleaned at all. That was the beginning of the headaches. Mind you, this place was only contracted at 3.5 hours a night to clean, but they frequently left me with 4 hours of mess. I found the refrigerator open once, the toilets unflushed, and the water on on different nights. You can find examples in the picture gallery. 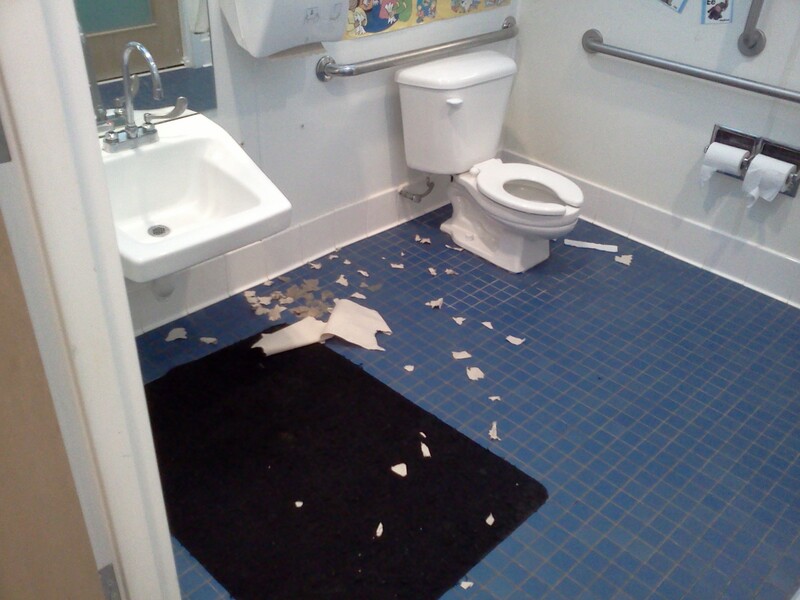 The most recurring issue was that of the preschool/toddler bathroom. I wondered if they even supervised these kids in there. I mean, these kids were worse than kittens. Not only did they leave it like this EVERY night, they left the toilet unflushed more than once, and a couple of times it was because they jiggled the handle so hard the chain fell off the lifter (in the tank.) So yeah, I had to take the cover off the tank, reach in (yes with gloves on,) retrieve the chain and put it back on the lifter to flush the toilet. The daycare personnel couldn't figure this out? Morons. If you can't really tell, there are several drops of corn syrup on the floor. These don't come up with mopping. These have to scraped up, yes, taking up layers of wax, or more likely, leaving behind a sheen of corn syrup on the floor. I am happy to report that after about two months of display, they finally threw it away. 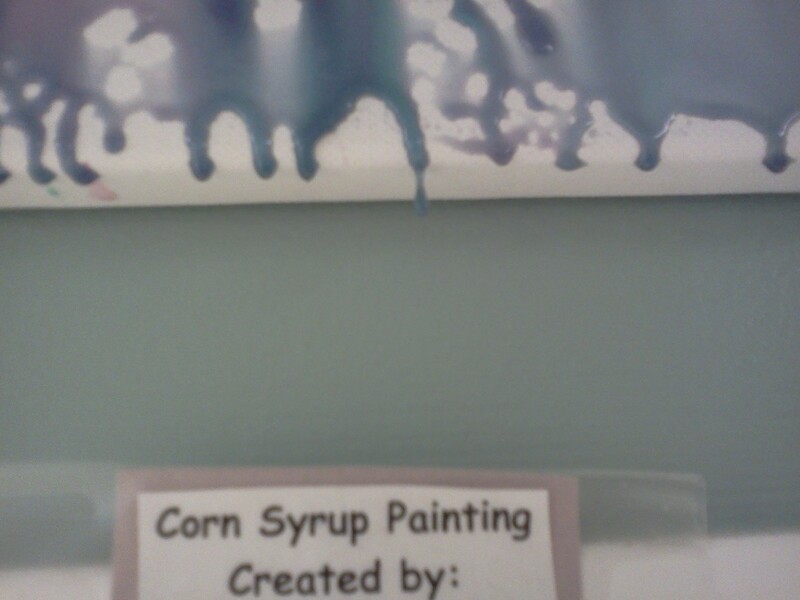 I believe it was after a particularly humid week and the painting actually dripped on one of the kids, I'm not sure. For the most part though, you don't see these paintings drip. Like the Weeping Angels, they drip when you're not looking, but look fine when you stare at them. Whatever, morons. I think my main issue with this account (but not anymore since I don't go there now) was simply this: What was my job and what was their job? Were they (are they) raising privileged children who expect that someone else will clean up after them? 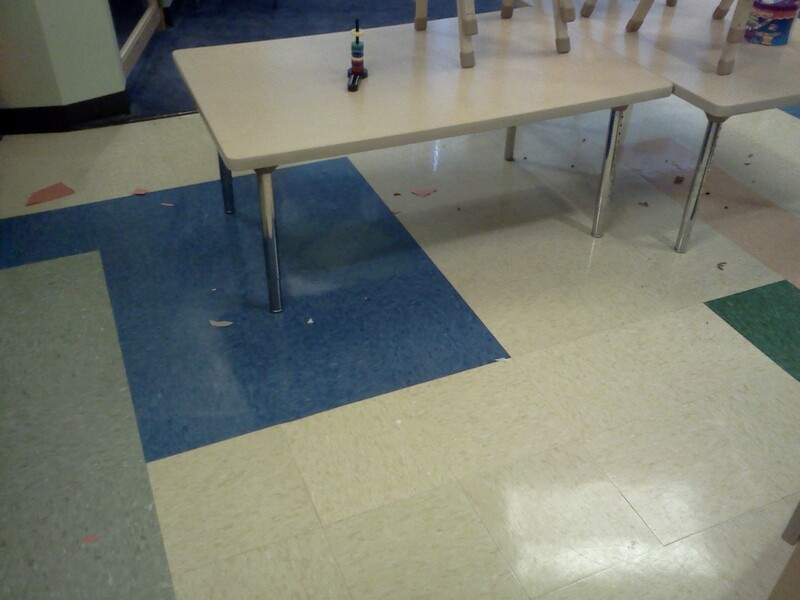 Was it my job to clean up their messes as well as making sure the place was habitable? I was under the impression that I come in after hours, clean the bathrooms (not clean up the bathrooms,) clean and disinfect the various children's rooms, vacuum and clean the floors. I have to say the worst, and nearly the straw that broke me, was the note that a child had vomited and could I spot clean the carpet under the blue blankets. I remember when I started with my boss he asked me if I had any issues with cleaning. He was impressed that I had no problems cleaning men's toilets and collecting trash. I told him I might have issues with diarrhea or vomit. What's funny is he shook his head then and said, yeah, he'd have a problem with that too and we would most likely not encounter any of that as that would be the owners of the account's job to clean that up. Ha ha ha, who's laughing now? I cleaned it but held my breath as much as I could and used almost a full can of Spot Shot. But I refuse to clean up vomit unless it belongs to one of my own children now. The second major issue is actually two-fold. First, they had a box delivered. I'm not sure what was in it, but it was packed in styrofoam bricks. You know what I mean, the packing bricks your stereo or alarm clock is packed with to keep it safe. Well, the kids shredded these bricks and the resulting beads were impossible to clean. It took nearly two weeks before they were all up. I seriously believe these kids, the school age kids this time, enjoyed having an aspiration hazard lying around. 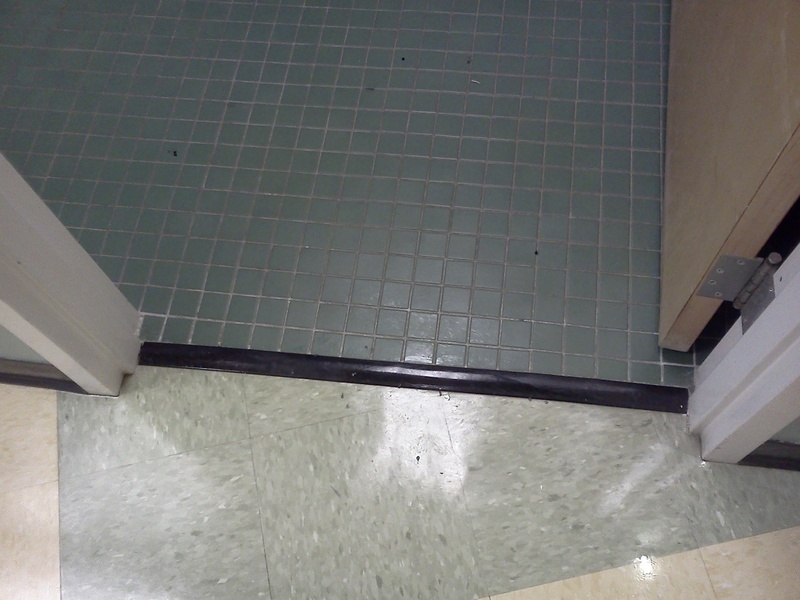 That said, the week before I was let go, they had a TON of tiny ball bearings all over the floor. I had no idea what broke or where they came from, but they hated the broom, as well as the dust mop and the vacuum. It took a few days to get them all up, and I let the daycare know to look for them. Not only were they an aspiration hazard, but a falling hazard. I didn't want the children to get hurt by slipping on them. Of course, why should I care about a bunch of children being raised with out the life skill of cleaning up their messes, children being raised to say "Oh, that's all right, the cleaner will get it."? I wash my hands of that account. Good-riddens and huzzah, I now can recover my lots wits and move on. The other side of that coin is now I'm working about on third the hours I had and I'm worried that I may not be able to pay for my car. So, please, buy my book, and tell your friends and family to buy one too. Support a starving artist. I may put out my midgrade novel after this, just in the hopes that I might recover some of this lost income. But who am I kidding? Mostly myself, it seems. Not part 2 or the moron rant. When we are children, we’retold we can be whatever we want when we grow up. We spend our childhood dreaming of beingdoctors, firefighters, police, and astronauts. We play games of adventure and fun. We admire actors and musicians and storytellers,imagining what life must be like for those characters we see. Some of us continue to believe this lie wellinto our adulthood. Some few of usactually achieve their goals of being what they dream. I was one of those whobelieved. I’m 39 going on 23 and I fancymyself an author. I have one book out, self-published,as many of you know. Maybe all of you asI’m not sure how many actually read my blog or my webpage. I have a few short stories out there in a fewdifferent places, Pill Hill, Wicked East, House of Horror, and the FlashFiction Offensive. I continue to believethat if I keep up with it, my writing may still be read by others, perhaps apublisher, and it may be bought, bringing in the royalties of a well-knownauthor. My husband thinksotherwise. He’s a realist. He’s told me many times that in all the timewe’ve been married, he’s seen me write, and seen nothing come of it. So, by reason, he thinks maybe I shouldreconsider my position. Maybe I shouldset writing aside for a while and get “a real job.” Oh, and my cleaning every night isn’t a realjob, and it’s beneath me. In otherwords, I need a real job that meets his standards for me. All of this has methinking. Why do we lie to ourchildren? In today’s society, can anyonereally be whatever they want to when they grow up? I see it everywhere in the inner city. Our young black kids are being raised byparents, or in many cases, a parent who has been beaten down, told they’re notable to do anything, not able to be anything, so they aren’t. In return, they beat down theirchildren. Not physically, most of thetime, but with words. Disrespect, everyone for themselves attitudes, what’s yours is mine, these ideas are expected, evenencouraged. When loud rap music or hip-hopcomes out of nowhere, we automatically think, “Black.” Moreover, we feel justified when the driverof the vehicle the music comes from is black. We as a society believe Hispanicsare lazy and can amount to nothing better than backyard mechanics. They are told so often that they can donothing that they believe it. NativeAmericans too, told all they can do is expect to grow up drunks so often thatthey believe it. Even women, since women’slib, being told they can only expect to be someone if they get married and havechildren. Whenever someone breaks out ofthe mold, it’s as a celebrity, someone so untouchable that we idolize them. We think, wow, they really did it. John Leguizamo did it, but apparently, no oneelse can. Tyrese Gibson did it, Ice T,Morgan Freeman, Cuba Gooding Jr. but I can’t. Wendy Williams, Tyra Banks, Queen Latifah, heck Jennifer Anniston, SalmaHayeck, Julia Roberts, they all did it, but we can’t. They were special. They grew up with money, power, they musthave or how would they have made it big? 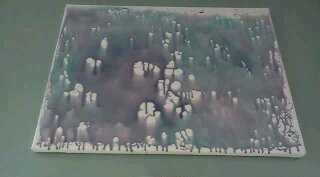 The white middle class family, average size four, mean income fiftythousand a year, they are the ones that seem to still lie to theirchildren. They say to them, dream, youcan be whatever you want when you grow up. Most people reading this may balk at the idea that we would tell any ofour children, regardless of race or creed anything else. You might call me a racist, sexist, whatever-ist,but I’m not. I do believe we shouldencourage our children, regardless of race, creed, gender, or income to becomewhatever they want. I believe we shouldencourage them all to become our future leaders, doctors, lawyers, actors,musicians, writers, police, firefighters, mechanics, architects, astronauts,and anything else they can think of. I tell my children theycan become whatever they want when they grow up. But I am a middle class woman, married withtwo children. Oh, how I have fallen. Is this really what I believe? I think so. But, is it really? When I was growing up, Iwas raised in a loving home. My parentsare still married to each other. Theytold me I could be whatever I wanted when I grew up. I played at adventures, planned trips allover the world. I wanted to explorecaves, deserts, and mountains. I stillhave a wandering spirit. I startedwriting stories when I was about nine, telling so many stories ofadventure. I wanted to go. I finally decided, after seeing adocumentary, that I really wanted to see Africa. I wanted to see the Kalahari Desert. I fell in love with the exotic languages ofthe indigenous tribes. I wanted tobecome a doctor, to minister to them, to witness God’s love to them. But then, out there all on my own, I’d needto be able to fix my Jeep, so I also wanted to learn auto mechanics. I believed so firmly that that was what Iwanted to do, I too auto mechanics in high school. I majored in biology in college. It was after my own dark night, my own soulsearching, that I realized, yes I would love to travel, but really, what I lovemost is imagining. I love writing, andevery idea that comes to my mind is an idea I have to write down. But when I told my parents I wanted to bewriter, suddenly the lie blew up in their faces. Suddenly “You can be whatever you want whenyou grow up!” wasn’t really what they wanted to say. But by then, it was write or go mad. Or maybe I was already mad and simply had towrite to live with it. I’m not sure. One fact is truethough. I did not grow up with money, orpower. I have never been in the rightplace at the right time. I was born toolate to be at the beginning and too soon to be at the revolution. I have seen the invention of the homecomputer and the advent of the laptop, and I have given up my pencil for a keyboard. I dropped out of college with delusions ofgenius and superiority, and promptly failed to get published. I fell into a depression, got a “real job”and tried to make my dream come true. Then I found a husband and had my two children, and now I’m a wife, amother, and a middle class American woman. I clean offices at night to supplement our average income, rather belowaverage income. Still I cling to beliefthat I can be whatever I want to be when I grow up. And I want to be a writer. I want to be published and read andremembered. In a hundred years, I wantpeople to say, “Oh, have you ever read The Other Side? No, the one by Jen Steffen. Yeah, it’s almost epic, but wow. That’s fantasy I can read. No lofty language, lots of action andbelievable characters. Yeah, theytotally need to remake the movie they did back when special effects were attheir advent.” I want people see my nameand pick up the book, or rather at that time, download the book, just because I’mthe author. I want to see my othertitles get picked up by a publisher, not because I’ll make more money, butbecause the prestige is greater than when I do it myself. Being picked up by a publisher says to theworld that you’ve been read by those who know good reading, and they have foundyou worthy. Therefore, if they like you,then the rest of the country will like you. Maybe even the rest of the world. I’m probably justmad. The voices in my head, the onesthat tell me stories, still cry to be let out, so I put them down on paper,even the ones I can’t make any money with. I’m a dreamer and an idealist. Ithurts me to hear my husband say, “Stupid driver, must be black.” Or my daughter say, “Yeah, some of the boyson the bus just wouldn’t settle down or listen to the leaders.” And when my husband asks her, “Were theyblack?” She nods sadly. “Yeah.” This isn’t because their racist. It’s because they hear it from society. They’ve come to expect it from certain races, certain creeds. And until we truly believe the lie, “You canbe whatever you want to be when you grow up.” And we truly pursue the deepest dream we have, and we stop falling shortof our own expectations, we will continue to live the stereotypes we’ve placedon ourselves. I will never amount to theauthor I want to be, because I’m not good enough. I’m not in the right place at the righttime. I don’t have money or power orinfluence. I don’t have a collegedegree. So I’m fit to be wife andmother, and maybe an office assistant or a retail clerk, and I should set mydreams aside. I should drop my loftyexpectations of humanity, especially those growing up in the inner city, like Idid. I should let it all go and come toterms with my own mediocrity because that’s all any of us will amount to. ‘Sup, y’all. Imma gon go hit up Target for some groceriesan maybe git my girl some new clothes. Then I gotta go to work later, clean a daycare run by morons. Imma go in, git it done, and come home tosleep. My husband will keep tellin methat I’m workin beneath me. I need asmart job, one that uses my brain. Um,what brain? I’m just a girl, lucky me,and I just can’t let go of that lie. “Youcan be whatever you want to be when you grow up.” If you’re a doctor, or a lawyer, or a police,or a firefighter, or a mechanic, or a grocer, or anything that will sustain youin the real world, because dreams don’t come true. But I want them to. I need them to. Please, can’t mine come true, just once? God? You gave me imagination and the ability to write. Can’t I use that? God? Iwant to be writer when I grow up. And Iwant to believe that the world can be a better place because children aretaught to believe in themselves, and that they can be whatever they want whenthey grow up. Obama did. Tyra did. Neil Gaiman did. Marion ZimmerBradley did. They still talk about a guynamed William Shakespeare. Can’t theytalk about me too? I can’t give up writing,no matter how mediocre I really am. So Ican’t give up on the lie. I have tobelieve it’s true. And if it’s true forme, then it’s true for you. Are you ayoung black man or woman? You don’t haveto stay in the inner city unless you really want to. You don’t have to disrespect everyone andeverything just because that’s what you see. You can work for change. You canbe whatever you want when you grow up. Areyou a young Hispanic or Native American? The same holds true for you. Areyou Muslim, gay, Asian, or poor? Thesame is true for you. If it’s true forme, it has to be true for everyone. “Youcan be whatever you want to be when you grow up.” You just have to keep believing, and keeppursuing. Never give up on yourdreams. When you start to believe it’s alie, that’s when you lose hope, that’s when the dream dies, and that’s when youhave to come to terms with your own mediocrity. And that would be really sad.